Yatra Sri Badrinath Dham: Sri Badrinath temple has been visited by devout pilgrims since ancient times, encountering the rigours of the foot journey. But now this abode of god in lofty laps of the Himalayans are easily accessible by road. This shrine is situated in district Chamoli, Uttarakhand. Shri Badrinath is guarded by the Nar and Narayan range near the near the towering Neelkanth Peak. The other hot water tanks are “Narad Kund” & “Surya Kund” in which pilgrims take holy bath. Vasudhara water falls is flowing down from a great height just at a distance of 4½ K.M. to the north direction. Badrinath stands first in the pilgrimage programmes as it bears the highest degree of supreme faith and dedication to God. At the back side of Badri Nath temple a valley opens to Nilkanth peak, which embodies all the divinity time, of Nilkantha peak. The Pujari of Shri Badri Nath Temple is known as the Rawal, who is Namboodri Brahmin of Kerala. Adiguru Shankracharya was also a Namboodri. 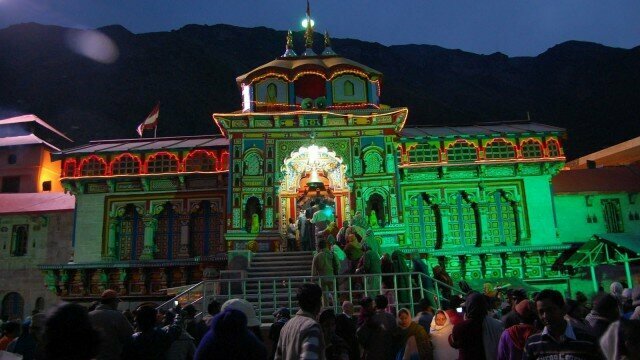 The Rawal is appointed jointly by the Badri Nath temple committee and Maharaj of Tehri Garwal. The Rawal is well-versed in Sankrit and Puja ceremonials. Sri Badrinath Dham: 298 kms from Rail-head Rishikesh.